Blackbird #1 is due out 10/3. 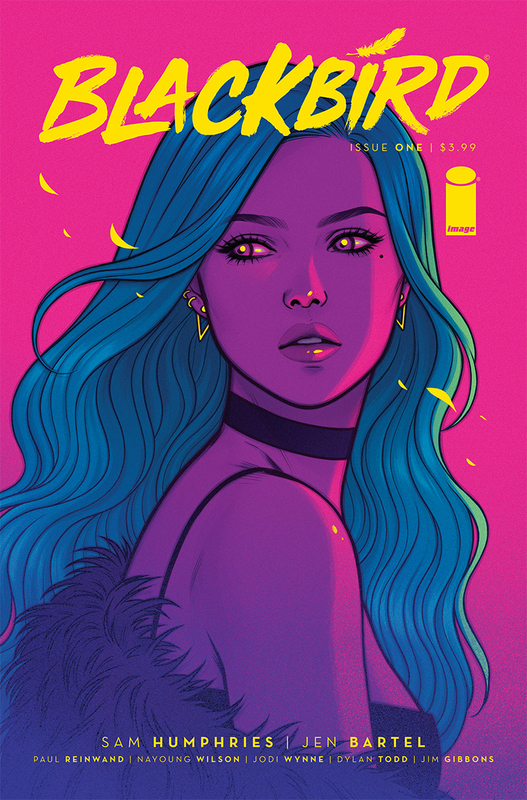 By Zack Quaintance — Blackbird #1 is an intriguing debut comic, a stylish fever dream steeped in family dysfunction and disaster and illusion and fantasy and escape, all tinged with a bright dusting of supernatural art. This book is, simply put, an incredibly-stylish story told in big clean panels, rich with memorable visuals and a firm narrative voice from its start. I found it to be thoroughly engrossing. Blackbird is written by Sam Humphries, who had an instrumental role in DC’s Rebirth line penning Green Lanterns and has since transitioned into writing Harley Quinn. Humphries greatest strength as a comics writer is perhaps his ability to write characters who talk to the audience as if they were a friend (or at least a chatty stranger). His narration makes this protagonist sound like she’s talking directly to us, telling a story, leaning in for support, or even opening up while knowing she’ll come to regret it. The result is a hero who feels and sounds real. My favorite bit comes about halfway through this issue, when she tells us: I became that girl. I talked about monsters and magic and wizards, like, all the time. I was a girl who made things up, said anything to get attention. But I know what I saw. There is magic in the world, I just can’t find it. The Verdugo Earthquake was ten years ago. Hi. This is me now….it’s a thesis statement, really, one that is intriguing, informative, and conversational all at once. It’s always hard to tell after a first issue, but thematically Blackbird seems interested in exploring the disconnect between childhood wonder and adult reality. It draws a constant and powerful connection to how kids deal with trauma by finding solace in the biggest and brightest ideas they can, whereas adults are more likely to wonder what the hell happened to me and how do I stop it? There’s a lot of universality here, universality that powerfully compliments the bold and bright linework supplied by Jen Bartel, who, to be clear, is a towering talent of an artist, one with a unique and kinetic style. Really, the visuals in this book are absolutely stunning, worth the price on their own merits. This book also seems interested in addiction, hints of which were used powerfully by Humphries in another semi-recent book, his follow up to Jason Aaron’s Weird World, which came out post-Secret Wars and was severely underrated. We live in a country where 200 people a day died last year from opioid overdoses. It is without question as serious an issue as any, and I’m curious to see how it factors into this excellent creator-owned comic moving forward.